The LeapPad Ultra Is a 2013 Hot Toy! My kids were hugely excited, when a LeapPad Ultra kid's tablet showed up from Mastermind Toys on our front porch! The LeapPad Ultra is a wireless learning and entertainment device targeted to kids aged 4- to 9-years old. By wireless, I mean it can connect to internet (if a parent grants permission), and can run 11 preloaded games and apps (on board and downloadable), download new ones from the internet (paid service), or play LeapFrog Explorer cartridges. (Leapster games are not compatible with the LeapPad Ultra.) Of interest, you can track your child's learning progress via the LeapFrog Connect app. Waiting Very Patiently to Try Out the LeapPad Ultra! The LeapPad Ultra features a 7" high-resolution light-touch screen, front and back camera with video recorder, built-in 9 hour rechargeable battery, 8GB memory (can hold up to 40,000+ photos or 100+ game apps, eReader, MP3 player, peer-to-peer play (if parent enabled), motion sensor and art studio. The Ultra is "kid durable" and has been drop-tested. There is a library of 800+ educator-approved games, apps and more (most are paid). An important feature of the device is a kid-safe wifi. The LeapPad Ultra arrives with a charge, so eager kids (and their parents) can get set up right away! Right away you can set up to 3 kids' profiles and quickly connect to your internet. Parent-mode allows you to access a child-safe version of the internet, which means you are directed to the LeapFrog App Center. When you initially connect to the internet, you can choose 1 of 3 games to download at no additional charge. My kids chose the Sugar Bugs toothbrushing game, which they love. My five kids are aged from 3- to 8-years old, and each enjoys the LeapPad Ultra. One of the first apps that they played with was the Voice Memo recorder, which they thought was a hoot! They had a great time recording their talking and singing, and then playing it back to hear. They also enjoyed the preloaded Pet app, which reminded me a bit of LeapFrog's Pet Pals game. And the Art Studio Ultra app (drawing and painting) is also very popular in my household. The Ultra comes with a stylus pen attached by a string, which stores in the back of the unit. My 4-year old loves the preloaded music (comes with 10 songs), but is sorry that the Bookshelf app did not come with any books. He also has a good time with the preloaded calendar, and my 7-year old daughter amuses herself with the notepad. Any additional games, learning apps, music and videos can be purchased via the LeapFrog App Store (shortcut is preloaded into the Ultra). Access the App Store either wirelessly, or by connecting the Ultra via USB to your computer. Use an App Center download card code to purchase apps, or purchase apps directly online without an app card. Once the app has been purchased, simply connect the Ultra to your internet-enabled computer via the USB cable provided. You will need the LeapFrog Connect free app installed to your computer to do this. Apps range in price from $5 to $30, and there are many like: Disney's Cars, Disney's Planes, Minnie Mouse, Sofia the First, Hello Kitty, My Little Pony, Barbie, Disney/Marvel Spiderman, Chuck and Friends, Phineas & Ferb, Doc McStuffins, Jake and the Never Land Pirates, Monsters University, Littlest Pet Shop, Thomas and Friends, Sesame Street, Clifford, Transformers and many more! 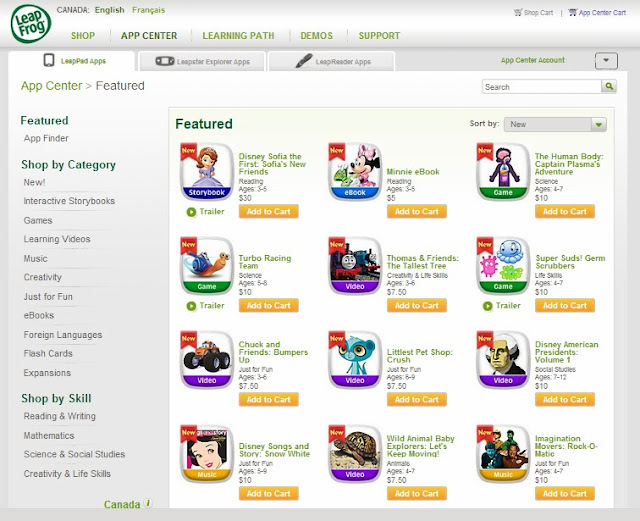 The apps feature very popular characters that will appeal to both boys and girls. FREE LeapFrog Ultra Download Codes! These two FREE LeapFrog Ultra download codes, below, will kickstart your device into gear! (Working as of November 2013.) Please comment if you downloaded successfully or otherwise. My 4-year old son is an avid Disney Cars fan, so I purchased the Cars 2 game ($30), the Cars 2 Expansion Pack to go with it ($7.50), Disney Planes Game ($10), and Disney's Greatest Hits Volume II ($10) as he loves music. My son has played the Cars 2 game many times and really enjoys it! I purchased the apps from the LeapPad Download Center using the code from a download card, and then connected the LeapPad Ultra to my computer via USB to upload the app. It was a very simple process, and when complete, the new app appears in the LeapPad Ultra's menu as a new icon. If you like the idea of a child safe internet, then you will like the LeapPad Ultra. There is no chance that your child will discover inappropriate content with this device. The LeapPad Ultra would more appropriately be called an intranet device, as it only allows connection to the LeapFrog Connect app. Content can only be purchased from LeapFrog (there is no free content), and you cannot add any photos, music or content from your home computer or the internet in general. 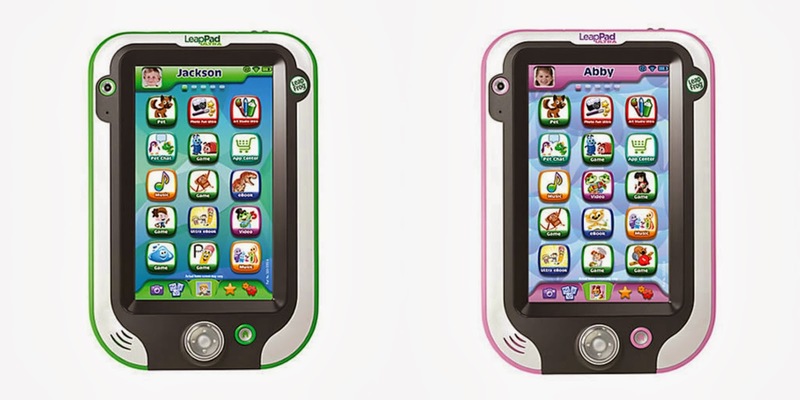 Buy the LeapPad Ultra (Green or Pink) From Mastermind Toys, $169.95! 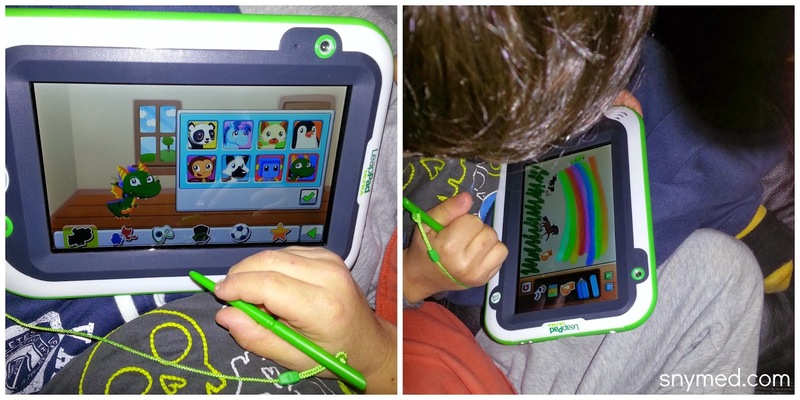 The LeapPad Ultra is a fun and educational device that your child (or grandchild) will enjoy. It won the Oppenheim Platinum Best Toy Award and is definitely on the SnyMed.com Hot Toys 2013 list! Purchase the LeapPad Ultra from Mastermind Toys (choice of green or pink) for $169.95, and have it shipped to the special child on your list for Christmas! Follow Mastermind Toys on Social Media! 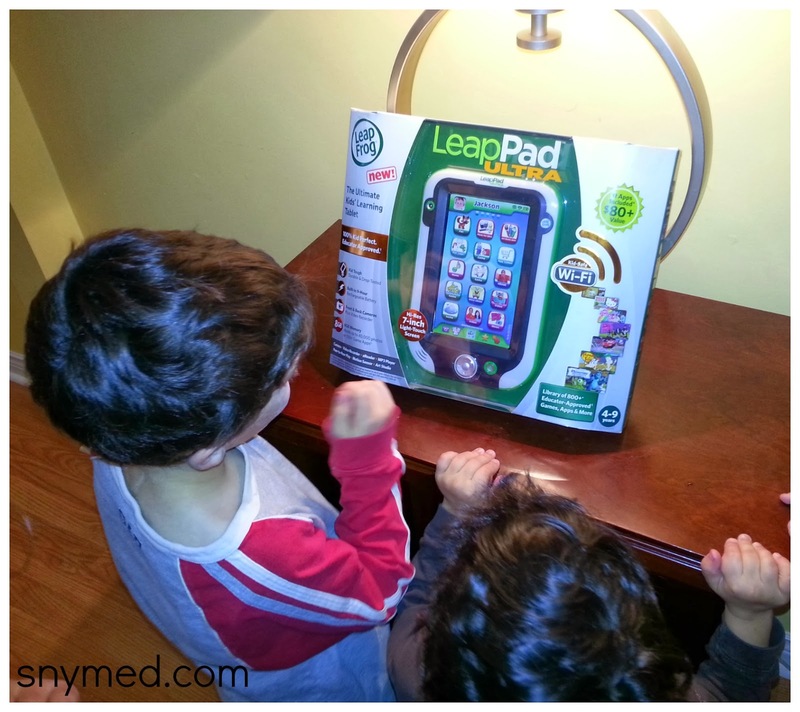 WIN a LeapFrog LeapPad Ultra kid's tablet (in either green or pink, subject to availability) from SnyMed.com! Contest open to Canada, and closes on Monday December 9th, 2013. Leave a COMMENT below stating who you would like to win the LeapFrog Ultra for OR what was the best gift you ever received as a child for a Christmas or birthday present. Then, use the entry form below to enter the contest. GOOD LUCK! Kaelyn would love this!~ Her little friend has one annd when we have playdates, kaelyn cant stop playing with her friends leapad. I'd love to win this for one of my grandchildren, which child would depend on which colour I received - I couldn't give a pink one to a boy - though I do think it would be the parents who objected more ;-). My son would LOVE this! Maybe he'll give my ipad back! I would love to win this for my little man this Christmas!! I would like to win it for my daughters (they are 7, 4 and 1 year old) it will be a good Learning games to share between them :). I would like to win this for my daughter. She has always been interested in electronics, so I think she would quite like this. 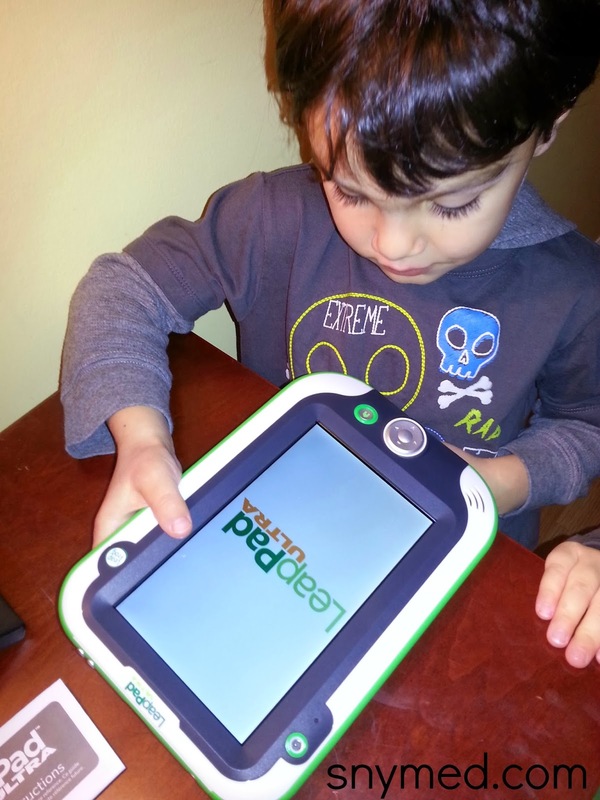 My youngest son Kyler (Will be 3 in January) would absolutely love to have the new LeapPad Ultra for Christmas!! He already has the LeapPad2 and it's his favorite toy, he's always so proud to be able to have a "Pad" all of his own! Even big brother Kaylob (age 8) likes to sneak some time on it, with the new LeapPad Ultra there would be so many more things to learn! My children are boys, I am trying to win this for my neice. I like the Yasmin doll. I would love to win this for my daughter Kaylynn!!! She loves games, books and electronic. Also my most memorable gift I ever received for Christmas would be a jelly bean bunny. I got her from my Nana's work xmas party. My Nana worked for Hallmark for over 25 years and every year she took my brother and I with her. My bunny was pink and smelt just like jelly beans! Miss them both terribly!! I would love to win this for my daughter Kaylynn. She loves books, games and electronics. My most memorable xmas gift was a pink stuffed jelly bean bunny who smelt like jelly beans. I got him for my Nana's work xmas party. She worked at Hallmark for over 25 years and took both my brother and I every year. they gave the best gifts!!! Miss them both terribly!!! I would love to win this for my girls 4 & 6, they would greatly enjoy it. I would LOVE to win this for my son who's always playing with my husband's tablet. If I win this, he can finally get his own 'tablet'. I would love to win these for my daughter for her birthday, she turns 3 in February! My oldest boy would LOVE this!!! I would love to win the leap pad for my 4 year old son. The best present I received for Christmas as a kid was my cabbage patch kid dolls! I would love to win this for my daughter, Helen. She loves all things technology and can do things to them that I still can't figure out, lol. I would love to win this for my three year old twin grandsons Liam and Matteo. With junior kinderg rten coming up next year the Leap Pad would provide them with so many interactive learning skills. Would love this for my son. He likes to copy his dad who has a tablet and this would be perfect without worrying he is going to wreck his dads ! I remember getting something similar for christmas when I was young it was great ! I would love this for my son. He lives to copy his dad on the computer and this would be perfect as I wouldn't have to worry about him wrecking his dads work tablet . I remember getting a similar laptop toy for christmas when I was young but it wasn't nearly as cool of the leap pad! I would love to win this for my kids. Thank you for the opportunity. I would love to win this for my granddaughter. We never had anything like this when I was a child or even when my children were wee. My favorite thing I ever got when I was a child was my Baby Alive doll. The best gift I ever received was a nintendo 64! I want to win this for my Great-nephew. I would love to give this to my grandson Aidan. My favorite Christmas gift was a Dall that drank from a bottle a wet her diaper. My mom sewed and knitted a layette for that doll. I would love to win this for my granddaughter as a Christmas present. I would love to win this for my 3 children to share. They have the leap pad 2 and absolutely love this. The wifi connectivity on this and the bigger screen is so awesome. My bf's daughter would adore this! My son has been pointing to this in the toysrus christmas wish book, would love to win him one. thanks for the chance. we LOVE leapfrog around this house! I would LOVE to win this for my son. He would get so much use out of it. I bet he would even leave his sister's tablet alone too. I would love to win this for my grandson! He's 5 years old and hearing impaired so he's behind the other kids his age I think this would help a lot! I would love to win this for my 4 kids! I'd love to win this for my son! I would absolutely love to win this for my niece. Auntie doesn't have a lot of money this year. Nice. Would love to win this for my kids. Thanks for the chance. Would love to win this for my kids. Thanks for the opportunity. My 3 yr old would love this! Thanks for hosting - I always hear such great things about the leappad! This would be so great for my daughter for Christmas, she'd love it! I would LOVE to give this to my middle son Logan for Christmas. I think he would do really well on this kind of game system. This is just awesome!! Leapf Frog was also on my list this year and your review sealed which product it will be..thanks!! Leap Frog was also on my list this year and your review has made which product would be right alot easier! Thank you!! Would love to win this for my 3 year old little boy! When I was 7 I got the Barbie Motorhome. It was so exciting! I would like to win a pink Leapfrog Ultra for my five year old niece Kaniyah. The only thing that wasn't so great about her report card was her reading/writing skills and I remember using Leap frog products as a child to help me with my learning and I want them to help her as well. I would love to win this for my daughters to share.They just turned 4 & 6 in the last week. This would be for my youngest, and then maybe he'll leave his brother's tablet alone! 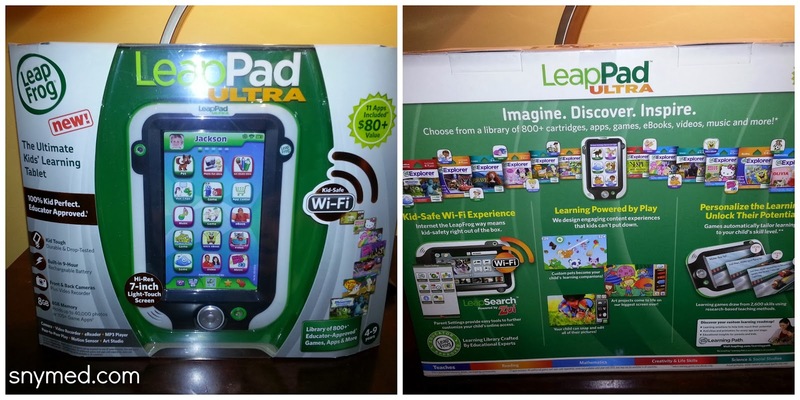 I would like to win the LeapFrog Ultra in green for my nephew! I'd love to win this for my goddaughter - she'd love it! I would love this for my son!!! I don't really remember any notable presents for Christmas as a child. But I do remember a care package delivered from our local Salvation Army the night our house burned down and I lost both my brothers. In it was the Best doll I'd ever seen! I'd love to have my grand-daughter open the best present she's ever seen! Thanks for having a contest like this. I'm SO sorry for the loss of your brothers, words cannot describe. How wonderful that the Salvation Army was able to do something nice for you on that evening. Dear Anonymous, thank you for sharing your story. I am sorry that you lost your family that night.. and thankfully you survived to tell it. Although I would like to win the contest, I think are are some pretty great posters like yourself who are just as deserving. Have a Merry Christmas. I would love to win this for my 5 year old! I would like to win this for my nephew. The best Christmas gift I ever got was the boy and girl Koosas (Cabbage Patch Kids Cats) - I could not decide between the boy or the girl and started crying in the store, I asked my parents to choose one and I would be happy with whatever decision they made. At Christmas.. they gave me the boy, but then disguised the box (it had an obvious shape) and gave me the girl one too. It meant so much to me at that time. I still have those dolls too. Cynthia, what fantastic parents you have! I remember Koosas! I would love to win this for my son who is 6. The best gift I ever received was a blow dryer and curling iron because it made me feel very grown up and no more rollers in my hair every year in the Christmas videos. I would love to win this for my daughters, 5 and 7! My little guys would be thrilled with this! They love LeapFrog products! My daughter's, Annabelle & Danica, would just love this! For my daughter and nephew. They love Leapfrog and would adore this as a new learning tool. I'd love to win this for my boys. :) Thanks for teh giveaway. I would love to win this for my youngest son. Best gift i ever got was a TV. My dad bought me one when I was in my mid 20s. I was a single mom, and didn't have the money to buy one. Would love to win this for my little girl! I would love to win this for either of my kids. Both would play on it, no matter what the color is. Would Love to win this for my 5 yr old grandson! Would love to win this for my 4 year old daughter! This would be for my grandson Kyler!! The best gift I received as a child was my Pound Puppy, after 30 years, I still have it and was able to give it to my daugher.